Ok, enough teasing. The twitter followers got the inside scoop with the twitpics, but here’s the ultimate way to serve your favorite soft cookies, like our Chocolate Chunk Cookies 😉 If you are a virgin to this sweet tooth delicacy, let me introduce you to a pizookie. 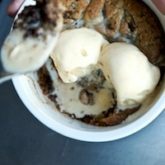 A pizookie is cookie dough baked directly in a dish (just like Chicago deep dish style pizzas) then while still warm out of the oven, it’s topped with ice cream and immediately devoured. A deep dish cookie. Absolutely brilliant. 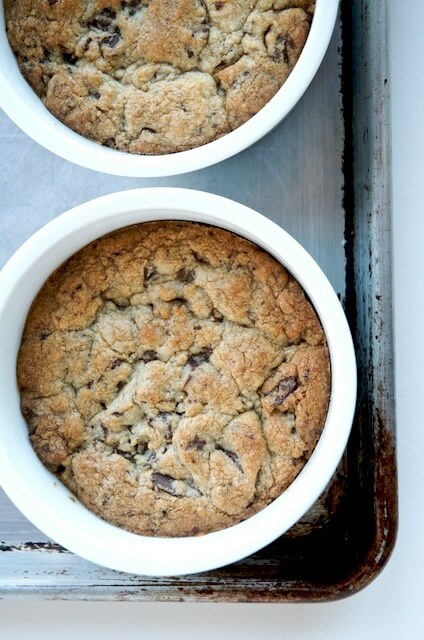 There are an unlimited amount of possibilities to making deep dish cookies. You want to use a cookie dough that makes a soft chewy cookie. 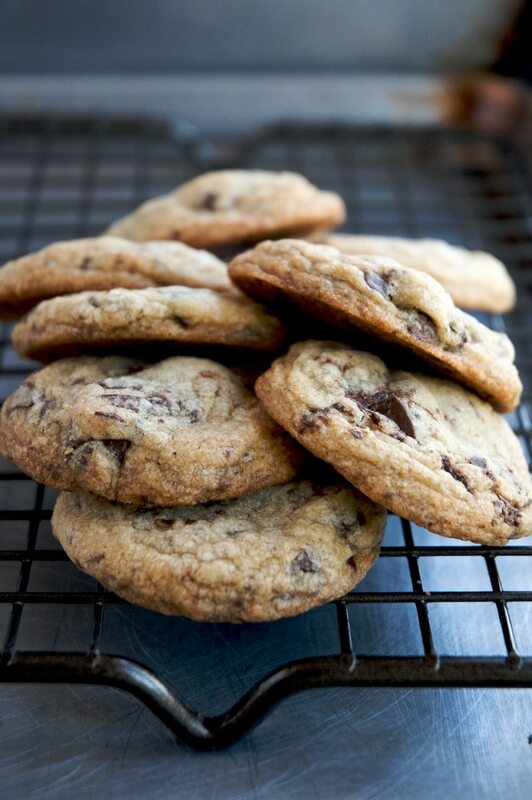 The chocolate chunk cookies in our previous post work beautifully. Other excellent cookie options are a good peanut butter cookie, oatmeal raisin cookies, chocolate cookies with peanut butter chips, etc… As I mentioned in the comments of the chocolate chunk cookie post, I’ll be sharing more of our baking recipes in the future and I guarantee there will be several cookie recipes that will satiate the most intense of cookie cravings and will also make perfect deep dish cookies. Don’t forget the finishing touch, the ice cream. Classically, a nice vanilla ice cream it a perfect topping, but deviations can be exquisite as well. 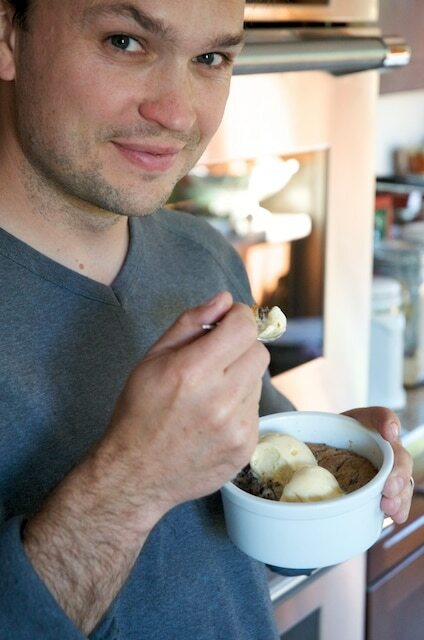 If you are feeling spunky, make your own ice cream, starting with David Lebovitz’s Vanilla Ice Cream recipe. 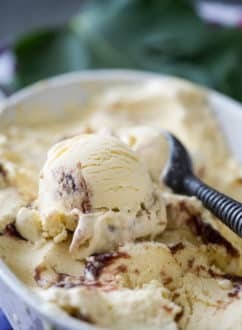 As summer rolls closer we’ll start putting up more of our favorite and others’ great ice cream recipes and introducing you to additional deep dish cookie combinations. Until then, enjoy this sweet and simple delight, our chocolate chunk cookie topped with vanilla ice cream. 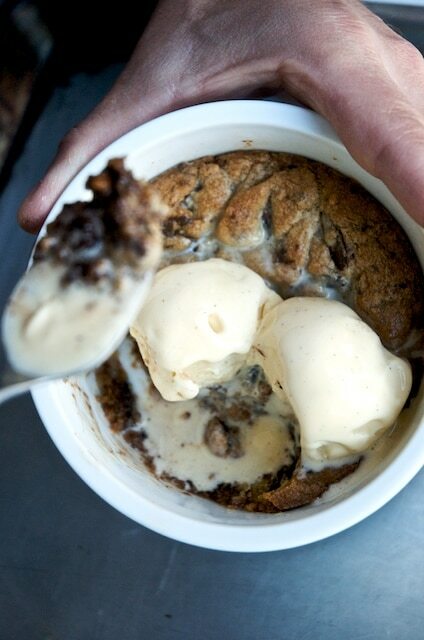 When you top the deep dish cookies with the ice cream, the warmth from the cookies start to melt the ice cream. 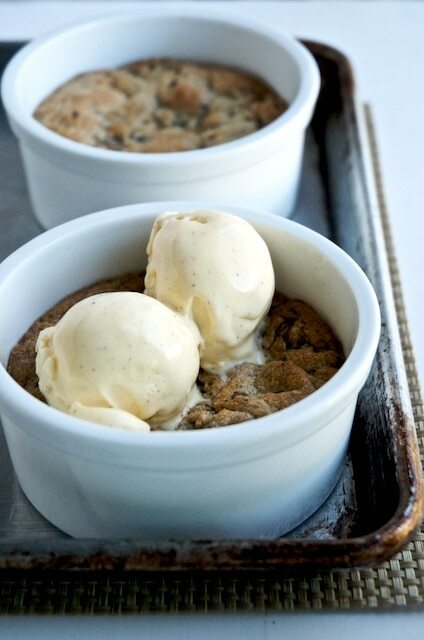 The beauty of cooking the cookies in a deep dish is that it preserves the melting ice cream, so each spoonful has the warm, chewy cookie contrasting against the cool creamy sweetness of the ice cream. Ice cream sandwiches are tasty, but deep dish cookies are in a league all their own. The tips for baking the chocolate chunk cookies apply the same here, only you want to emphasize the under baking even a little bit more. The thickness of the cookies and the type of baking dish you use will ultimately determine your cooking time, so watch them closely at the end to determine the cookie’s doneness. We usually use 4″ ramekins filled about 1/2″ high to make a deep dish cookie to split between the two of us (although I’ve been know to make them a bit higher.) A 3″ ramekin is nice for a hearty 1 person serving. The big cookie rule applies to deep dish cookies as well, if you make bigger deep dish cookies, lower your oven temp about 25° F and extend your baking times. Enjoy. 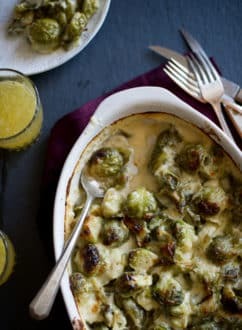 Remove from oven and place each ramekin on a napkin (this allows you to hold the hot dish as you eat your dessert delight.) Top with a couple scoops of ice cream. Grab a spoon and enjoy. There’s a local pizza place that does pizza cookies like this. We HAVE to get it every time we go. It might be dangerous if I can make these at home! Hi!! I about fell out of my chair when I saw these cookies! I can’t WAIT to make them. I even featured them on my blog today so that all of my readers can indulge in this. I love your blog, too!! I made these last night and they were everything I expected and more, really really delicious!! As someone who generally prefers raw cookie dough to the finished product, I love this idea! I always err on the side of underbaked when it comes to oatmeal and chocolate chip cookies, and this seems like a natural progression. Very excited to try this out! this is genius! I am in love with this idea!!! This is now in my weekend to-do list! 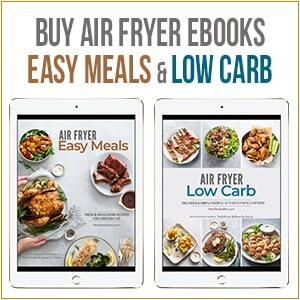 would love to feature this on my blog and share with my readers! let me know if this is okay – credited to you of course. oh, and i can’t wait to bake it and make my taste buds happier than EVER! WOW! that looks great… I got to have a taste. I moved down to Southern California last year for college, too, and also discovered pizookies! I have to say, it’s a little life changing. These look delicious!! I may need to cancel plans tonight to go home and make this. You know, there is a place here in town that makes a similar creation in a small cast iron pan but they add weird crap like margarine (eww! )…but the pan it gets the edges nice and crusty. I’ll try it. Hell, I’ll try it both ways. I don’t even care. I’m just hoping to make it to the oven without eating my hand. these look UNREAL. i am moooourning the fact that i don’t own a ramekin right now. I’ve made these twice and they were a hit! Mine took a bit longer to bake… 20 minutes or so — can’t exactly remember because I checked on them a couple of times. The hot cookie and the cold ice cream made my teeth hurt, but it was worth it! Awesome. So glad they were a success. Baking time will vary a bit depending on how thick the dough it, the type of dish you are baking, etc. Always going by personal judgment is the best. Diane’s teeth are sensitive to the temperatures as well, but lucky for me mine are like marble. Yay for pizookies! GOOD LOOOOOORD!!!!!!! This recipe looks TO DIE FOR!!!!!! I am going to make this TONIGHT! Wow!! I’ve never heard of this idea before and I obviously have been deprived. I love it! We’re ramping up the ice cream making (also faithfully devoted to DL’s Perfect Scoop) and this gives me new inspiration. Thanks for a wonderful idea! You can’t make just 4 of those. You just can’t! It’s not right. At least a dozen! Memoria – Have fun with the ice cream maker! 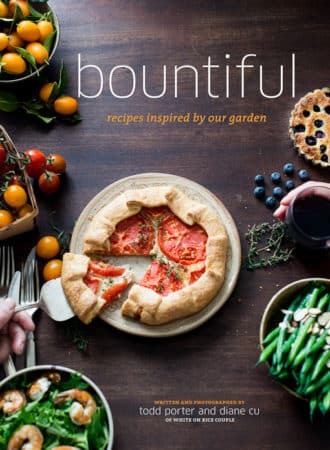 Make sure you try some of David Lebovitz’s recipes. The man knows his cream! T.
I love BJ’s pizookies! Thank you for posting this recipe. I have my first ice cream maker on the way to my house, too! I will be making both as soon as the maker arrives on the 27th from Amazon! Thanks! Coffee & Vanilla – Thanks. We’re just passing on the brilliance. Carla – We haven’t tried snickerdoodles deep-dish style, but that could be super tasty. 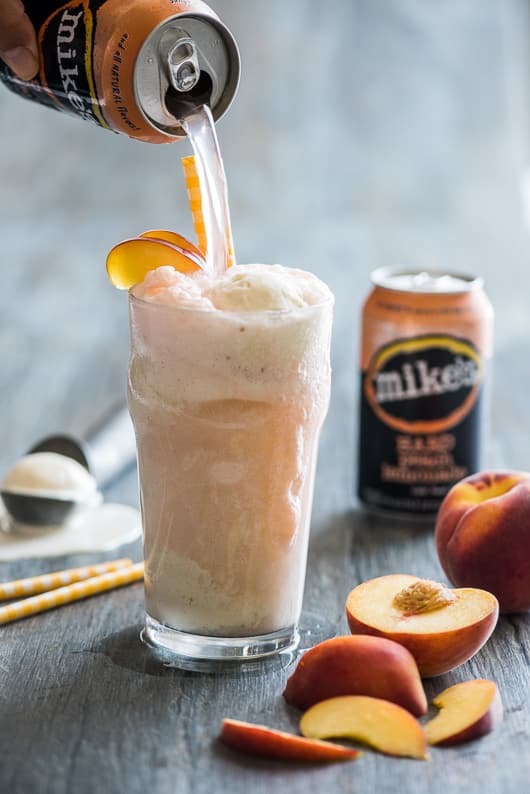 Add a little sauteed apples with the ice cream… Have mercy! Sandie – It is cookie heaven! Katrina – Ahhh, sounds so good. Love the lava. rachel -We’ll have two for you! Thanks for visiting and sharing the sweetness, everyone. Todd. Deep dish cookies sound great! With melting vanilla ice cream to boot! I did this, too, a few months back and “hid” extra chocolate goo in the middle, called them molten lava cookies. SOOOO good. Absolute heaven! I want to try your ccc recipe! Asianmommy – They are quite tasty. Madam Chow – We’re sorry and your welcome. Giff – These are always a hit. Not sure why they aren’t more widely known, but it is a delicious secret. Carolyn – Quite so. Little tweaks in presentation can make all of the difference. Nan – We’d love to hear how they turn out. You may become addicted. Thanks for visiting everyone! We’d love to hear the of the different cookie doughs everyone uses and ice cream combos. To those about to indulge, we raise our spoons to you! Todd. I love this idea. It totally makes any ol’ cookie much fancier and fun. You could use your fave cookie recipe and turn it into a scrumptious dessert fit for company. It takes a lot of stress out of hosting a dinner party. Wow, these look good. I’m wondering why this isn’t more prevalent. What a decadent dessert, and a fun way to surprise guests with the ramekins. I’d never heard of this. My thighs may not thank you, but I certainly do! Kim – As crazy as an insane asylum! krysta – Nah! I’m the lucky one. She’s a salt girl so that leaves more cookies for me to eat. A couple bites and she’s done. Red Dough District soon open for business! Lori Lynn – Yeah, most Chicaga-ans I know love these dear to the heart. Happy now post-Easter to you! Manggy – I’ll come up with something extra tasty just for you. The Italian Dish – Oh yeah. DDC (deep dish cookie) addicts in the making! Jeff – Gotta start freezing that dough so you can make just enough every time. It’s been a while since we’ve had deep dish pizzas, too. We’ve only been making thin crust ones lately. A soft deep dish pizza does sound very tasty right now. matt – Thank you and thank you. You gotta makes these for those lovelies in you life. They’ll love you even more! grace – It’s nice being spoiled, isn’t it! zestycook – Thank you very much. Jackie – Be careful. They are highly addicting. Hélène – Your next party will not be forgotten. Thanks. It’s the first time I see this original dish. I’m already all crazy about it. Thanks for sharing! I’ve never heard of pizookie. I’m sure they will be a hit a my next party. Brillant! This is simply amazing! I love it! Great post with amazing photography. oh my. what a tremendous creation. i’m ruined for life–no regular cookie will ever satisfy me again. OMG guys. Wonderful looking stuff. Never heard of a deep dish cookie before, but now I want to make one. And, er, HELLO AMAZING PHOTOGRAPHS!!! so clean and simple, but just amazingly elegant. Just loving this post. On a side note now I am craving deep dish pizza. Been so long since I have had one and this just reminded me of the joy and joyness that is deep dish pizza. Interesting take and I like the fact I would not be stuck with 4 dozen cookies that I have to unload. Brilliant! My family is going to love these! BRILLIANT! And thank you for the promise of more pizookies to come! I actually ate at BJ’s last year, but would you believe that I wasn’t able to when I went to San Francisco this year because they had an hour-long wait for a table? Insane! Hailing from Chi-town, I do love this deep-dish idea! Happy Easter Todd & Diane! oh hell yeah! that makes you a pimp! diane is a lucky gal!!! can you imagine a stable of girls working for you? all wanting to be paid in pizookie? i guess we’d have more cushion for the pushin’… so to speak. Oh wow that is so outta control. Straight on the next to make list. Holy crap, this has sparked a feeding frenzy. I have to be quick because I’m still at work and tonight we’ll be prepping for tomorrow. Looks like everyone is loving this uber-indulgence as much as we do. Krysta – does this make me a cookie pimp? I could live with that. Hope everyone has a great Easter! Thanks for the love & drool. Todd. Oh, that looks so good…..I made a skillet cookie once, but never thought of deep dish cookie before….Todd you look happy on the photo….no kidding, with something like that, who wouldn’t? Sweet Jesus. Like I need a reason to make these. What I NEED is a reason NOT to make these. Brilliant idea, gorgeous photos as usual. I especially love Todd’s (no-you-didn’t) oh-yes-I-did look on his face in the first picture. He soooo knows how in trouble we all are. yum! these look fantastic and i am sure they are better than bj’s pizookies. I love this! I’ll definitely keep this one in mind for our next dinner party – takes good ol’ cookies and ice cream up an extra notch. Uh oh! Deep dish cookies? This could be very dangerous for me. Very dangerous indeed! They look incredible! What a GREAT idea–this would be fun at a kid’s party!! Or any party, really. Thanks! Easy & so delicious!! great idea! your last post was lip-smacking, mouth-watering good! and i couldn’t agree more – there is nothing at all as deliciously exciting as a perfectly baked, warm, soft chocolate chip cookie. that is… until i read THIS post !! might have to revise that statement and add “deep dish” in there! if it weren’t Passover, my oven would have already been preheating ! this is going to be the first thing i make/eat once the holiday is over ! 🙂 THANKS for sharing the recipes !! This is simply amazing and a fabulous idea! This I am gonna try! And I agree that vanilla (or coffee) is definitely THE flavor choice to go with those chocolate chunk cookies! This looks absolutely mouthwatering with the melting ice cream and the chocolatey interior. I have one of the coupons to try a pizookie at BJ’s for free, but I never had gotten the chance to try it. Now, I need to! And I need to make them at home :). Oh, that is brilliant! I’m definitely going to try that… they look fantastic. Thanks so much for sharing with those of us not fortunate to have experienced BJ’s Brewery. OMG! Pizookies are now on my list for dessert this week! Thank you, thank you, thank you! Nom Nom nom… I’m having evil thoughts about making chocolate chip cookies just to melt ice cream on top!! I applaud you for that statment. If that baby was in my hands, there would be no sharing involved! Oh MY. How did I get through childhood without knowing about pizookies? (Actually, now that I type that out, maybe it’s because my parents assumed it was more of an R-rated something or other?) Anyway, I am looking forward to introducing these my own kids. 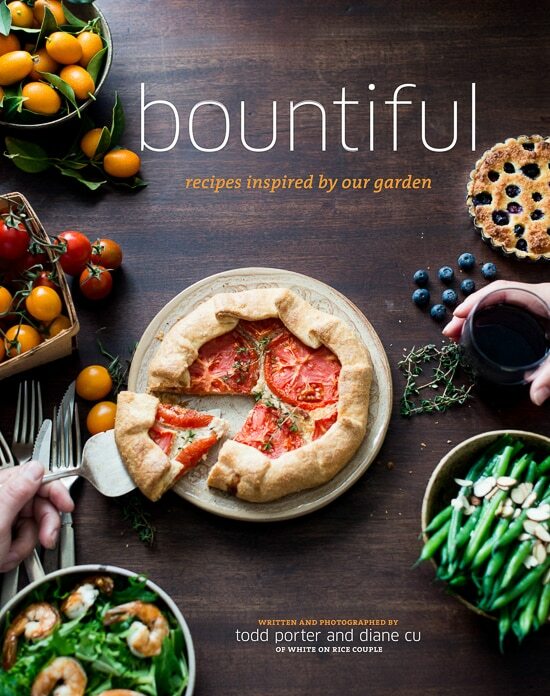 Love the flexible approach to the recipe, too! I’ve been craving these every since the Tweet. My mom used to make something like this, but it was actually pizza pie-sized! BTW, I love the new header. So elegant. Just saw the tweet on the twitterstream and had to check these out. I’ve never heard of a “deep dish cookie” before. I think I’m in deep trouble! This looks awesome and I love how the dish also holds the melting ice cream- brilliant! 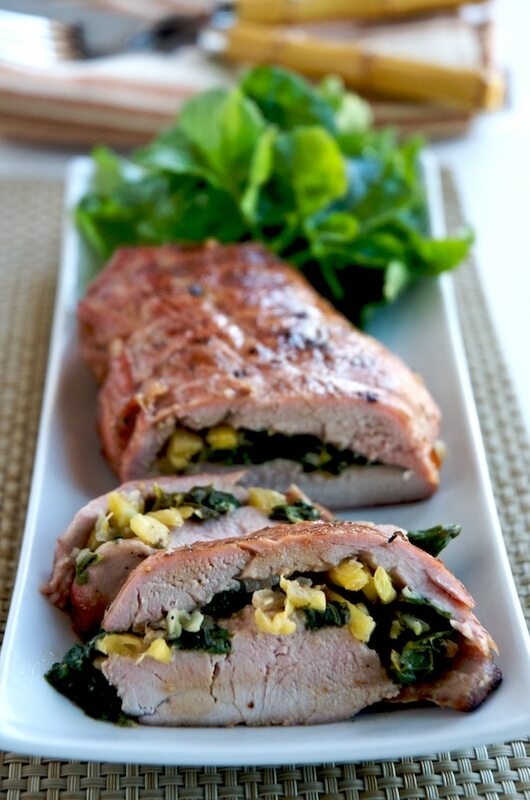 Adding this to the test kitchen & I know exactly when I am making it …… yum!